PE-DESIGN® NEXT LINK - Link up to 4 PR-1000 or Upgraded PR-650 Machines with Queue Functionality. Watch to learn more about the new, convenient USB-style software key, new chain stitch and net fill stitch and intelligent color sort to reduce thread changes. 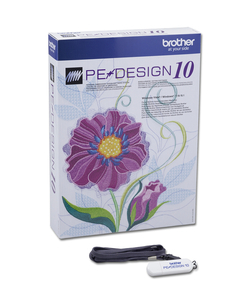 With more than 1000 built-in designs and 130 built-in fonts, as well as enhanced PhotoStitch™ masks and color settings and enhanced density setting for 3D and puffy foam, it's easier than ever to bring your design vision to life. USB style Dongle with installation program on USB device. New Stitch Types – explain that gapping can result or lines can peek out. Block punch tool can be edited with outline tool functions including remove overlap, Merge, set hole sewing, create offset lines, applique wizard, create floral lines, etc. Resizing has been improved doesn't tend to change the stitch type. Edit points available for circles and squares.